Omega-3 fatty acids have all sorts of benefits for your body and brain. Many mainstream health organizations recommend a minimum of 250-500 mg of omega-3 per day for healthy adults (1, 2, 3). You can get high amounts of omega-3 fats from fatty fish, algae and several high-fat plant foods. Here is a list of 12 foods that are very high in omega-3. Mackerel are small, fatty fish. In Western countries, they are commonly smoked and eaten as whole fillets at breakfast. They are incredibly rich in nutrients, and a 3.5 oz (100 g) piece of mackerel provides 200% of the RDI for vitamin B12 and 100% for selenium (4). On top of that, these fish are quite tasty yet require almost no preparation. Omega-3 content: 4107 mg in one piece, or 5134 mg per 100 grams (3.5 oz). Salmon is one of the most nutrient-dense foods on the planet. It contains high-quality protein and a variety of nutrients, including large amounts of magnesium, potassium, selenium and B-vitamins (5, 6). Studies show that people who regularly eat fatty fish, like salmon, have a lower risk of diseases like heart disease, dementia and depression (7, 8, 9, 10). Omega-3 content: 4023 mg in half a fillet, or 2260 mg in 100 grams (3.5 oz). Cod liver oil is more of a supplement than a food. As the name implies, it is oil that is extracted from the livers of cod fish. Not only is this oil high in omega-3 fatty acids, it is also loaded with vitamin D (338% of the RDI) and vitamin A (270% of the RDI) (11). Taking just a single tablespoon of cod liver oil therefore more than satisfies your need for three incredibly important nutrients. However, definitely don’t take more than a tablespoon, because too much vitamin A can be harmful. Omega-3 content: 2664 mg in a single tablespoon. Herring is a medium-sized oily fish. It is often cold-smoked or precooked, and then sold as a canned snack. Smoked herring is a popular breakfast food in countries like England, where it is served with eggs and called kippers. A standard smoked fillet contains almost 100% of the RDI for vitamin D and selenium, and 50% of the RDI for B12 (12). Omega-3 content: 3181 mg per fillet, or 1729 mg per 100 grams (3.5 oz). 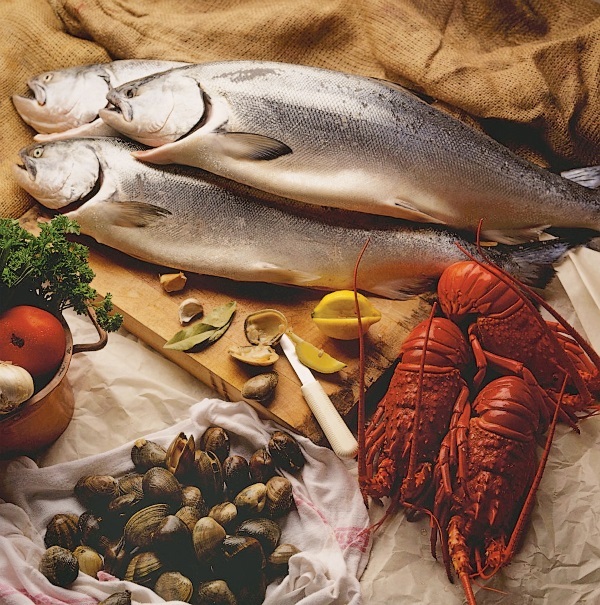 Shellfish are among the most nutritious foods you can eat. In fact, oysters contain more zinc than any other food on the planet. A 100-gram portion of raw oysters (6–7 oysters) contains 600% of the RDI for zinc, 200% for copper and 300% for vitamin B12 (13, 14). Oysters are usually eaten as an appetizer, snack or whole meal. Raw oysters are a delicacy in many countries. Omega-3 content: 565 mg in 6 oysters, or 672 mg per 100 grams (3.5 oz). Sardines are very small, oily fish. They are commonly eaten out of a tin or jar as a starter, snack or delicacy. Sardines are highly nutritious, especially when eaten whole. They contain almost every single nutrient that the human body needs. One cup of drained sardines provides over 200% of the RDI for vitamin B12, and over 100% for vitamin D and selenium (15). Omega-3 content: 2205 mg per cup, or 1480 mg per 100 grams (3.5 oz). Anchovies are tiny, oily fish that are often found dried or in a jar with oil. They are usually eaten in very small portions, such as rolled around capers, stuffed in olives or as pizza and salad toppings. Because of their strong flavor, they are also used to add flavor to many dishes and sauces, including Worcestershire sauce, remoulade and Caesar dressing. Anchovies are a great source of niacin and selenium, and boned anchovies are also rich in calcium (16). Omega-3 content: 951 mg per one can (2 oz), or 2113 mg per 100 grams (3.5 oz). Caviar consists of fish eggs, or roe. It is widely regarded as a highly luxurious food item, and is most often used in small quantities as a starter, taster or garnish. Caviar is high in choline and exceptionally low in omega-6 fatty acids (17). Omega-3 content: 1086 mg per tablespoon, or 6789 mg per 100 grams (3.5 oz). Flaxseeds are small brown or yellow seeds. They are often ground, milled or used to make oil. These seeds are by far the richest whole food source of the omega-3 fat called alpha-linolenic acid (ALA), and flaxseed oil is often used as an omega-3 supplement. Flaxseeds are also very high in fiber, vitamin E, magnesium and other nutrients. They have a great omega-6:omega-3 ratio compared to most oily plant seeds (18, 19, 20, 21). You can read more about the different types of omega-3s in this article. Omega-3 content: 2338 mg per tablespoon of seeds, 7196 mg per tablespoon of oil. Chia seeds are incredibly nutritious. They are rich in manganese, calcium, phosphorus and various other nutrients (22). A standard 1-oz (28 gram) 2-tbsp. serving (24 g) of chia seeds contains 4 grams of protein, including all eight essential amino acids. Omega-3 content: 4915 mg per ounce (28 grams). Walnuts are very nutritious and loaded with fiber. They also contain high amounts of copper, manganese, vitamin E and important plant compounds (23). However, do not remove the skin, as it contains most of the phenol antioxidants found in walnuts. Omega-3 content: 2542 mg per ounce, which amounts to 7 about walnuts. Soybeans are a good source of fiber and vegetable protein. They also contain high amounts of other nutrients, including riboflavin, folate, vitamin K, magnesium and potassium (24). However, soybeans are also very high in omega-6 fatty acids, so they should not be relied on as a sole omega-3 source. We need to get omega-3s and omega-6s in a certain balance. Omega-3 content: 1241 mg in half a cup, or 1443 mg per 100 grams (3.5 oz). Keep in mind that foods 1-8 contain the omega-3 fats EPA and DHA, which are found in some animal foods, seafood and algae. Conversely, foods 9-12 contain the omega-3 fat ALA, which is inferior to the other two. You can read more about the different types of omega-3 fats in this article. Although not as high in omega-3 as the foods listed above, there are many other foods that contain decent amounts of omega-3 fatty acids. These include pastured eggs, omega-3 enriched eggs, meats from grass-fed animals, grass-fed dairy products, hemp seeds, as well as some vegetables like spinach, Brussel’s sprouts and purslane. As you can see, getting plenty of omega-3s from whole foods should be relatively easy. However, if you don’t eat much of these foods and think you may be lacking in omega-3s, then check out this omega-3 supplement guide.